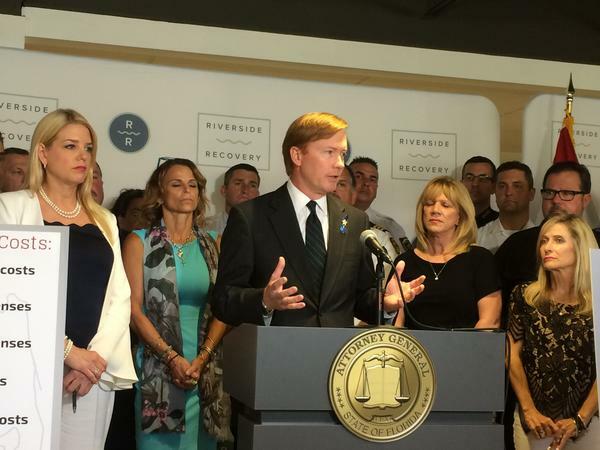 Adam Putnam at a news conference on May 17th. On Thursday, the Republican gubernatorial candidate announced his campaign plans for public safety with a focus on fighting crime and combatting the opioid epidemic. Putnam unveiled his "Secure Florida First" platform at a Tampa news conference Thursday. It also includes strengthening school safety in the wake of the Parkland shooting and halting sanctuary city policies in the state. The current Florida agriculture commissioner said, if elected, the state will find ways to secure more funding for school resource officers so districts won't have to dip into their own pockets. "We're going to have to continue not only to invest in what we traditionally think of as being education funding but also supporting these school districts who are struggling," Putnam said. In addition to more funding, he said, as governor, he would improve mental health services for students and prioritize checking social media and sites like YouTube for threats against schools. In fighting the opioid epidemic, Putnam said he will allow law enforcement to aggressively pursue opioid traffickers and will also increase maximum sentencing for drug offenses. He said overhauling Florida's mandatory minimum sentences for violent offenders is not up for discussion. "Reviewing mandatory minimums for violent offenses is not a option. It is part and parcel of what has made the success of us driving down the crime rate possible," Putnam said. He would continue with Attorney General Pam Bondi's effort to sue pharmaceutical companies for their role in the opioid epidemic. Putnam also said he would broaden the agreement between Florida sheriffs and federal immigration officials so officers would have more authority to detain immigrants who are in the country illegally.